Ice Fire Fleece Figure Skating Jacket - Skate With Heart. 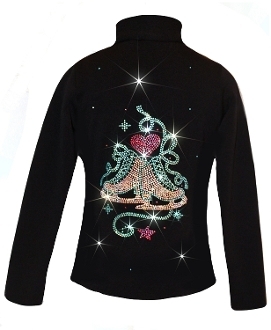 Polartec Fleece Figure Skating Jacket features a "Skate with Heart" design made with apx. superior machine cut Czech rhinestone AB Clear, AB Fuchsia and AB Aqua crystals. Very special and absolutely beautiful. Choose from Child XS - Adult L.